iPad mini, flagship tablets from Apple, now comes in four generations: iPad mini/mini 2/3/4. With enough big screen and high definition, iPad mini is a popular device to enjoy videos on. However, it’s disappointing that iPad Mini only supports a few video formats like MP4, etc. The popular format FLV is out of luck. In case you want to watch YouTube videos on iPad Mini offline, this small tablet seems to have nothing to do with it as YouTube videos usually come with FLV format. So if you feel like to share YouTube video with your friends and play FLV on iPad Mini, you have to convert FLV video to iPad Mini compatible format in the first. Well, MacX Video Converter Pro is here for you to do this job perfectly. World No.1 fastest iPad mini FLV converter to download/convert FLV clips to iPad mini 4/3/2/1 other iPads with the fastest speed and no quality loss! Besides, for those who want to download YouTube videos to iPad Mini, this professional iPad video converter also makes it happen in a few clicks, which enables you to download and play YouTube movies videos to iPads with super high speed and excellent video quality. After free download Mac FLV to iPad Mini converter and install it, click "Add File" button and locate the FLV files which you want to convert or simply click "YouTube" button, then copy and paste the URL of the FLV video in the box you want to convert. Fist of all, click "to iPad" button and choose to convert FLV to iPad mini 4/3/2, or iPad Pro, Air 2 and other devices. You can also change audio and video parameters as you wish. After finish the above steps, click the "Start" button to start transferring FLV to iPad Mini on your Mac OS X, you could view the conversion progress and are able to cancel the converting process at anytime. 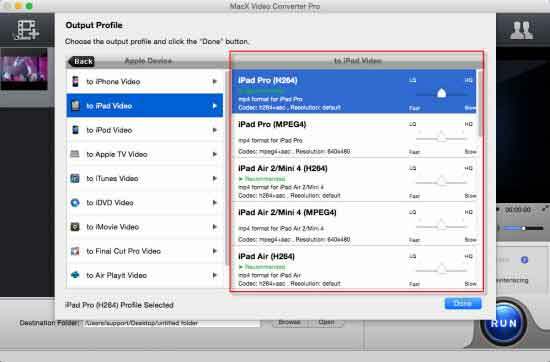 For those who would like to convert to more output formats with this iPad video converter, it would give a hand by providing more output formats like to MOV, to MP4, to YouTube, to Music, etc. Download YouTube MP4, FLV videos and convert to iPod touch 4, iPhone 4, iPhone 3GS, iPhone 3G, iPad with MacX Video Converter Pro. Works as YouTube downloader and FLV video converter, it helps Mac users to convert all HD and mainstream videos to WMV, AVI, MP4, MOV, VOB, FLV, MPEG, etc for playback on iPhone, iPod, iPad, PSP, mobile phone, and more.